As some people and 99.9% of Candains know last weekend was Canada day weekend. This constituted for me a 4 day weekend and a perfect opportunity to go on a fishing trip! A few hours later laden duitifuly with a box of Time Spiral (yippie!) my friend Jay and I set of on what promised to be a fun weekend. 36 packs and a few hours later we're almost at the cabin we'll be staying in for 3 nights and 4 days of fun. After a good nights sleep and a few hours of fishing Jay and I played decks constructed from our 18 packs each. Jay played a black red aggro deck while I played a blue red control deck. Needless to say Jay got the upper hand and crushed me in the best of 3 series we played with these decks. After this game I wanted to make a good deck that wouldn't go out with the 10th edition release and would still stay strong with the phase out of the Ravinica block. My answer was simple, playtest. Now, I bet most of you are wondering what in gods name does this fishing trip have to do with Magic Online. This is what, playtesting. After those 3 nights and 4 days of fun. 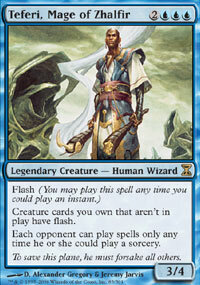 I duitifully came home and as I love to do built a deck on Magic Online. Price: most Magic Online cards cost way less than what real cards would cost if you bought them individually from a store or online site. Availability: you're always going to find a match. Unlike your local game shops where you play on certain days (ex. Friday Night Magic), Magic Online offers a huge range of opponents playing many different decks to try your creation out on. Also card availability. In real life a store may be sold out of a particular card you may desire, this is not the case on Magic Online, you can always find the card you want! Brine Elemental: Morph this 5/4 for 3 mana and then for 7 (5 colorless 2 islands) turn it face up to make the player skip his/her next untap step. This is a end of game clincher. Fathom Seer: a 1/3 for 2 mana or you can morph it face down as a 2/2 for 3. Ever wonder what to do if you need to draw cards and have excess mana or are mana screwed? Flip this little beauty up and return 2 islands to your hand and you can draw 2 cards! Riftwing Cloudskate: Suspend this 2/2 flier for 3 turns for 2 mana or play it for 5 (2 islands, 3 colorless). When this beauty comes into play it returns a permanent along with it. 5 mana (3 islands, 2 colorless) for a 3/4 that has flash and makes all your critters in your hand have flash. If this wasn't eanough it disrupts like no other allowing your opponents to play all their spells any time they could play a sorcery. Brutal! Teferi Mage of Zhalfir: for 5 mana (3 island 2 colorless) its a 3/4 with flash that makes all your unplayed critters also have flash. If this wasn't eanough it has the effect of making your oponent only be able to play spells when he/she could play a sorcery. Brutal! Venser, Shaper Savant: flash, 4 mana, and return target spell or creature to its opponents hand when it comes into play, this 2/2 packs punch! 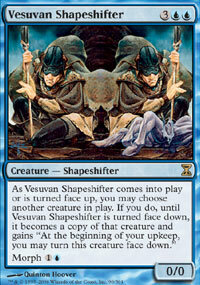 Vesuvan Shapeshifter: Ever wonder how to beat the gof deck? Simple, make a copy, use the shapeshifters to copy any monster and you can switch what you copy. Willbender: This one rules, turn it face up and change the target of a spell or ability targeting only 1 permanent or player. Ancestral Vision: suspend 4 for 1 mana, draw 3 cards, awesome. Cancel: Bugs the hell out of anyone trying to cast a spell when every good one they cast gets countered! For only 3 mana (1 colorless 2 blue) you can do it all! Delay: for 2 mana you can suspend any spell comming into play for 3 turns, sweet deal. Serated Arrows: Your answer to weakening a big critter over time or taking out a few 1/1 serated arrows is a great one! 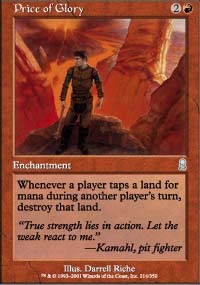 Desert: Lands dealing damage, thats always good! Urzas Factory: For late in the game when you need some boddies just create some workers! Aeon Chronicler: Suspend it to draw cards or use it as a monster, its all good either way! Take Possession: for 7 mana steal your opponents best creature. This card allows you to take possession of enchanted creature. 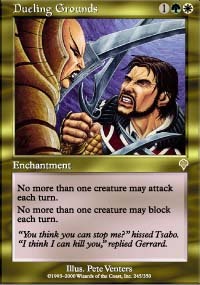 After a few days of play testing I find the deck plays well against most decks but suffers vs a few agro decks. 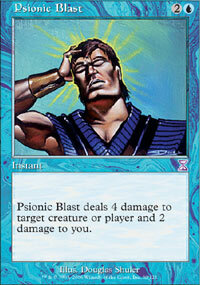 In the sideboard I personally swapped 1 Brine Elemental and 1 Fathom Seer for 2 Psionic blasts and they really help. The decks main strategy is morphed and suspended creatures make your opponent unable to block when you hit hard, the deck is a pain with all its counter spell abilities and is a joy to play! When 10th comes out this deck will only get better! Until next time, see ya!